The weather seems to have been the dominant theme this past month and although Ophelia was the storm that was most in the news (perhaps it was her name) we had some pretty damaging rain the week before. After the rain stopped I paddled down to Crummock by High Park to Sandy Yat but could not get further round than the promontory: the photo below is of the wall and path towards the pumping station. 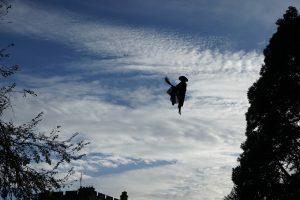 I had to go back the way I came and was rewarded by seeing a diving peregrine over Melbreak – what could be better. Ophelia was just very windy, not much rain, but took out our electricity for sixteen hours: tree on a power line by Watergate. 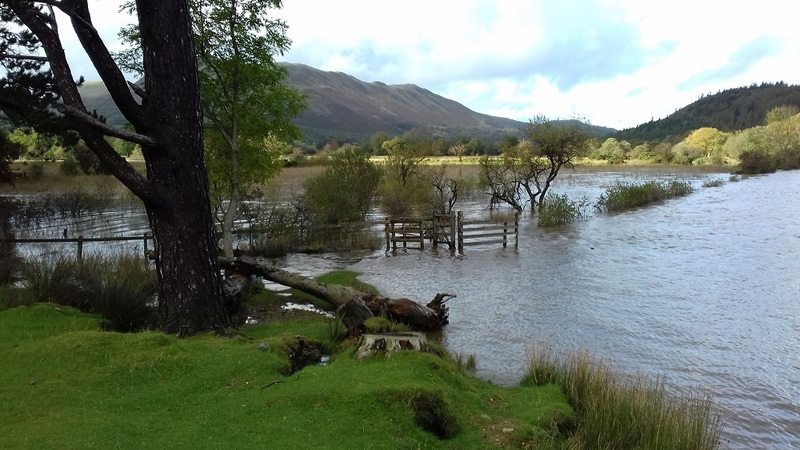 The day after Ophelia I went for a walk along the Loweswater terrace path only to discover that the rain the previous week had washed away the bridge at High Nook – no sighting of it anywhere apparently, thought to be at the bottom of Crummock! I heard and saw the first flock of migrating geese overhead about a week ago and there have been several since. The fieldfares have also fluttered in. 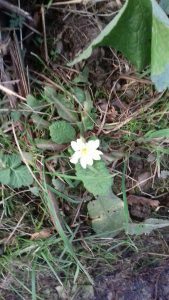 There is still colour in some of the hedgerows, dog daisies and campion mainly but the biggest surprise was an unseasonal primrose on the track down to Maggie’s bridge. Although we have had some disappointing weather there have been some better days. 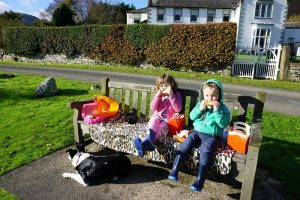 Last week my son Paul and his family came to stay for halfterm and on a beautiful sunny day the children and I picnicked outside on the bench. 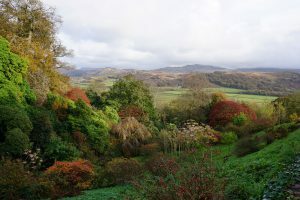 We took the opportunity to go to Muncaster one day: the autumn colours were looking impressive from the castle ramparts. They also do an excellent Hallowee’en for all ages! 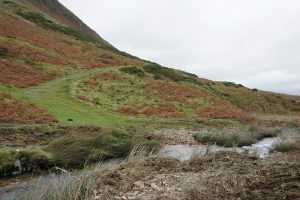 We had our first frost at the weekend – wonder when there will be snow on the fells this year?